If you ever wondered why the king sheets you brought down with you when you moved to Costa Rica never seemed to fit properly, then join the club! Most of us never think about things being too different in other countries. Weather, food, language for sure – but beds? Most countries may call their beds King, Queen, Full or Twin, and some have a bunch of other in-between sizes like XL-Twin or California King. However – the big reveal is that each of these beds have different dimensions in almost every country in the world! The reason is that the Western names have been given to the popular sizes in that country to follow Western culture. The sizes however, are usually specified by the Institute of Standards in each of these countries. The first of these organizations came into being around the time of the Industrial Revolution and set out guidelines to ensure that standards for all kinds of things as well as furniture are understood and followed. A “Standard” is just a protocol which is widely accepted, and these guidelines also incorporate such issues as strength, durability and safety for manufacturers to reference. There are many internationally recognized standards that we take for granted, such as musical notes, chemical and math symbols, and the clock, the calendar and mapping to name just a few. But it is not that simple for beds and mattresses. 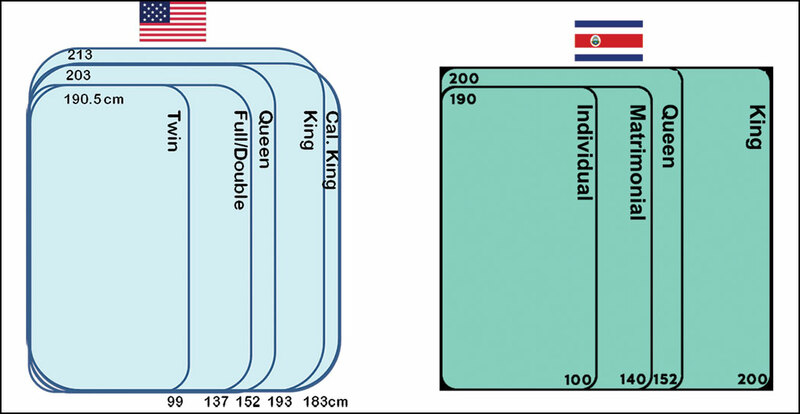 In Costa Rica the bed and mattress sizes are still called King, Queen, Full (Matrimonial) and Twin (Individual), but as you may have discovered, the sizes do not match their North American counterparts. For example, a King mattress in the US is 76” x 80” , but in Costa Rica it is 200cm x 200cm (about 79” x 79”). You can still find US sized beds and mattresses here but it is always a wise idea to make a thoughtful decision on the size of beds you want to use in your new home. Even if you bring sheets from back home to fit the beautiful new N. American sized bed you had specially made, think about where you will purchase extra sets when you need them in the future. Most of the sheet sets you will find outside of the Central Valley will be for Costa Rican mattresses and will be rougher in texture. They have a lower thread count that you would normally use, and will not fit your U.S. sized mattress. 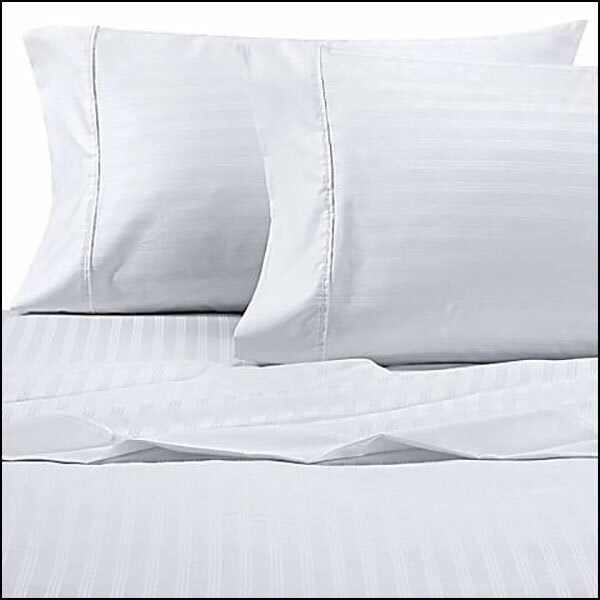 So to find US sized sheets and bedding you will probably need to go to the luxury bedding stores in Escazu to buy them as they will be imported. It often makes more sense to work with the bed and mattress size of the county you are living in because we all know that imported items cost a lot more. There are a couple of really good quality mattress manufacturers in Costa Rica and excellent, hotel-quality sheets, pillows etc. are always available in Uvita*. Thinking that you are saving money by bringing your own sheets and bedding down with you may end up driving you crazy trying to find a mattress to fit them! Do not be fooled by believing all you read in these expat blogs. Do your own research and make informed decisions. Any good mattress brand will offer options at different price points, and the most expensive model is not always the best. Choose what is right for you. Even if a mattress has a 15 year warranty you may want to change it sooner for hygiene reasons, especially if you live near the beach or in the middle of the rainforest. The memory foam mattresses so popular back home can be warm to sleep on, plus all foam seems to degrade more quickly with the amount of heat and humidity we have here, so consider all these things before you buy. 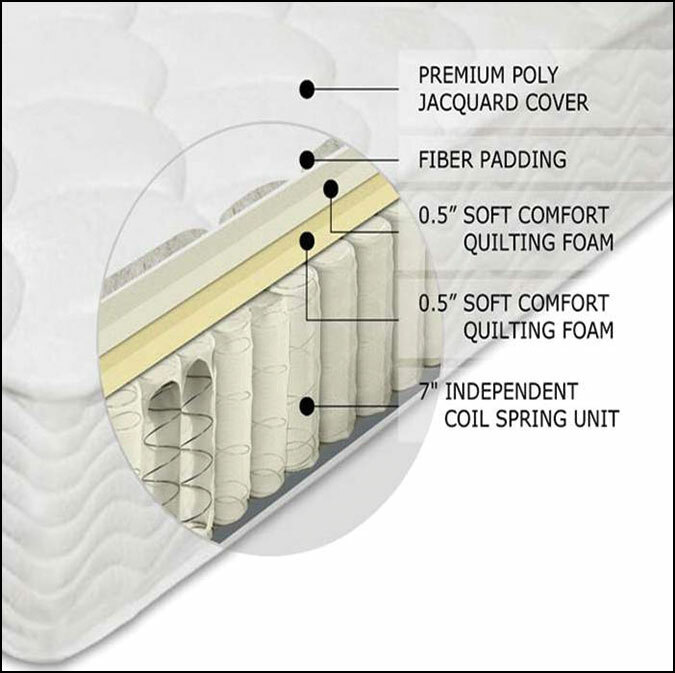 Most mattresses will have an open coil spring system, but better mattresses will have high density spring coils and they will be individually wrapped (pocketed). This feature was first mass produced around 1870 and has like all things, been perfected along the way. The pocketed coils will significantly reduce the transfer of motion from one sleeping partner to another. They will also give superior support and reduce body pressure points because of better weight distribution on their smaller springs. The mattress upholstery is another feature to consider. More layers will typically offer you more comfort, and most mattresses nowadays have an incorporated pillow-top feature, for added luxury and comfort. Once you have decided on the bed size you want, you will need a mattress that will fit that particular bed. Whether you stay with the familiar US sizes, or move to the CR ones, remember that you still need the right sheets and bedding to fit your new bed. None of this is complicated of course, but knowledge is power, and now you know what to consider when you start on your hunt for the perfect bed. 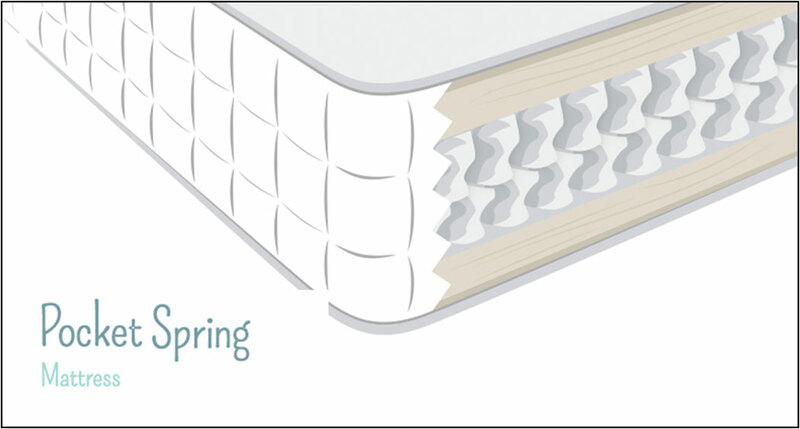 To help prolong the life of your mattress add a new mattress protector right from the start. 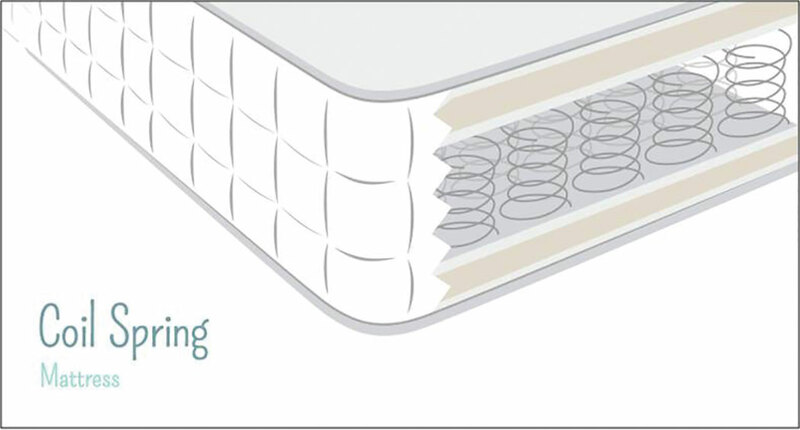 We also suggest you vacuum your mattress occasionally to help keep it free from dust and allergens, and get into the habit of regularly rotating it, to even out the normal wear patterns. It may take a little while to adjust to sleeping on a new mattress whichever size you choose, but you will never regret buying quality.